I enjoyed reading this book again this morning. Rereading a book years later is a blessing, and a good book stays new. I discovered Modern Haiku, when Robert Spiess was editor, in the early 1990s, through Poet’s Market. I think I must have subscribed at first, because he published from Madison, Wisconsin (where I lived once upon a time for four years). I was growing a new chapter in life and searching for connections, the old to the new. 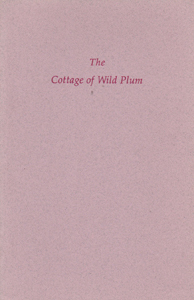 There are many connections in The Cottage of Wild Plum, as along with his varied poems, as Jim Kacian observed, Bob Spiess quotes from other sources in literature. I also enjoyed seeing paintings by John R. Reynolds again. It has been wonderful to see how new editors, poets, and artists have continued with Modern Haiku all these years. Varied styles here too, yet the same journal in many ways, with Bob’s legacy always honored. I’m sure others could add much more to this comment; I write here simply as a reader of the journal.